Please may we introduce Pauline, our first e-Shedder. Pauline is of a certain age (of which we are not certain) but she is a lady of get up and go. Very active in the Sleights community, not least for her long involvement with the Village Hall. Pauline has taken interest in many local activities and initiatives including SAMS Shed which she has visited and knows quite a number of the Shedders there (particularly Bob). 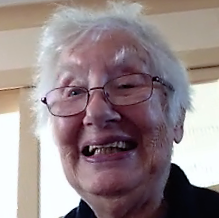 Pauline has daring-do and she has tackled the making and receiving of Skype calls with a a small circle of friends and family. It did not take long to realise that Shed and Skype could come together and she could see what was going on and have an occasional ShedChat. We feel inclined to waive any Shed fees!! PS. Reading what has been written to Pauline before publishing, she spoke of an experience in Whitby last night where she had gone for a meal at the Star Inn with friends. As she left she saw quite a few young people close by in a group (as they do like to congregate and jostle a bit). She also found that a wheel on her walking frame had become stuck. One of the youngsters then stepped over and said he’d help her and promptly released the wheel. She was so pleased and thanked him. She told Graham that you can’t tell a book from its cover (not even an e-book perhaps)!